North Carolina has it share of ghost tales, unexplained phenomena, and tales of the supernatural. One such tale comes from Jamestown, in Guilford County. 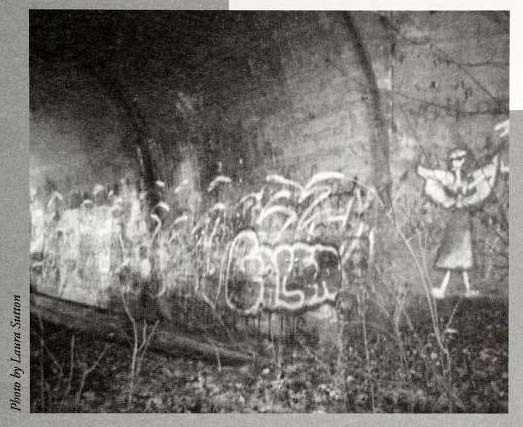 It is said that the spirit of a young woman haunts the underpasses of two bridges: one is a railroad bridge over E. Main Street, currently in use, and the other is of an abandoned bridge nearby. The abandoned underpass may be the site of a fatal car accident many years before. The spirit, known as “Lydia”, has been seen on rainy and foggy nights as she walks alone or stands beside the road searching for help to get back home. The legend of Lydia is based on sightings and stories, over the past seventy or more years, of a young woman in white as she stands by the road, attempting to flag down passing motorists for help. The ghost is believed to be that of a young woman who died tragically at the bridge many, many years ago. The stories that have grown around the alleged sightings share a common detail of a fatal car accident that occurred as a boy and girl drove to a dance, perhaps the prom, on a rainy night. And since that accident, the spirit of the girl, wearing her formal dress, returns to the scene seeking help. Local lore tells of the first sighting of Lydia around 1924. North Carolina folklorist Nancy Roberts included the account of an eerie sighting of a woman near the bridge in her 1959 An Illustrated Guide to Ghosts & Mysterious Occurrences in the Old North State. As collected from a man named Burke Hardison, he told of his encounter with a young woman as he traveled home to High Point on a rainy and foggy night when he was a student at NC State University thirty years earlier in 1924. Back then the bridge was over Highway 70 nearby, and although since abandoned, it is within view of the present-day railroad bridge over Main Street. Hardison claimed to see a girl dressed in a white gown. She signaled for him to stop and asked him to help her get to High Point. He drove her home, and when he went to get out of the car, she had vanished into thin air. He knocked on the door of the house, asked if the girl was there, only to learn from her mother that she had been killed in a car accident at a nearby overpass the year before. There have been many attempts to match records and evidence with a real person named Lydia, but none have turned up any conclusive proof of a young woman by that name who may have died in an automobile accident in the area during the 1920s. In recent times, two local researchers who have been chasing the Lydia legend for many years, Amy Greer and Michael Renegar, came upon an article in the Greensboro Patriot from June 21, 1920 that reported the tragic death of a young woman named Annie Jackson who had been killed on the High Point Road about three miles from High Point and close to the location of both bridges: in the account, when the driver lost control of the vehicle, Annie was thrown from the car. The article noted that the road was wet and the car “turned turtle.” Might this be the origin of the ghost and legend? The story of the ghost of Lydia is part of a cultural myth known as the "Vanishing Hitchhiker". One of the first systematic studies or compilations of examples of the legend construct was made in 1943 by folklorists Rosalie Hankey and Richard Beasley. The folk legend continues to be studied and has taken hold in popular myth, urban legend, and in television and film. And in 2000, the story received attention in the North Carolina Folklore Journal, with details about the history of the publication of the myth, variations on the tale, and examples of how each generation has left its own spin on retelling. Many people over the years have claimed to see the girl in white alongside the road. Some have stopped to help, only to observe her vanish when they step out of their cars or turn around for a moment. Today the old bridge is cloaked in vines and overgrowth, giving it the aura of mystery and the supernatural. Both underpasses have become graffiti shrines to the folk legend. Sutton, Laura E. “Lydia Lives at the Jamestown Bridge: A ‘Vanishing Hitchhiker’ in North Carolina.” North Carolina Folklore Journal 47:2 (Midwinter, 2000), North Carolina Folklore Journal https://archive.org/details/northcarolinafol472nort/page/118 (accessed February 3, 2019). Roberts, Nancy. 1950. An Illustrated Guide to Ghosts & Mysterious Occurrences in the Old North State. Charlotte: Heritage House. Bennett, Gillian. "The Vanishing Hitchhiker at Fifty-Five." Western Folklore 57, no. 1 (1998): 1-17. doi:10.2307/1500246. Beardsley, Richard K and Rosalie Hankey. 1943. A History of the Vanishing Hitch-hiker. California Folklore Quarterly 2:13-25. Walser, Richard. 2002. North Carolina legends. Raleigh: Office of Archives and History/North Carolina Dept. of Cultural Resources. Sutton, Laura E. "Lydia is here." Photograph. In “Lydia Lives at the Jamestown Bridge: A ‘Vanishing Hitchhiker’ in North Carolina.” North Carolina Folklore Journal 47:2 (Midwinter, 2000), North Carolina Folklore Journal https://archive.org/details/northcarolinafol472nort/page/118 (accessed February 3, 2019).